I remember going to Walt Disney World when I was 7-years-old and the place was so big my parents actually rented a stroller to cart me around from place to place. Okay, that’s kind of embarrassing to admit, but my point is, Disney World is enormous! The whole, incredible place is made up of four Theme Parks, each of which has dozens upon dozens of rides, shows, shops, and restaurants. My money’s on the rides, but, honestly, what makes Disney World so awesome is that there is something unforgettable for everyone to enjoy, whether you’re a thrill seeker, a Broadway buff, or just in it for the souvenirs. Since there’s so much to see and do, it’s a good idea to strategize and make sure you have time for all the absolute must-dos/sees. That’s why I decided to put together this A+ list, because the last thing you want is to show up at Disney World and be so overwhelmed by choices that you freeze up and miss out on some of the best parts. 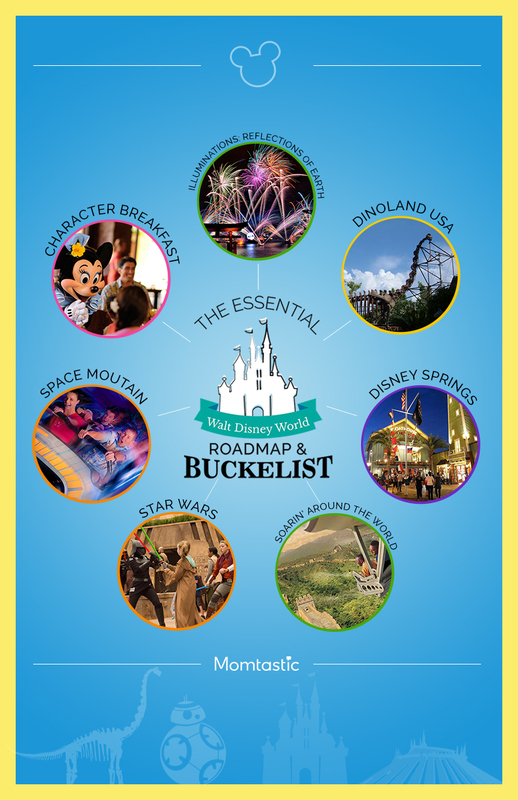 Once you get through this essential list, you can always check out the other fantastic sights and rides, but I guarantee you will be beating yourself up if you don’t make it onto the Soarin’ Around the World aerial adventure or take a ride on Space Mountain. So, grab your Mickey Mouse ears and get ready to create the most memorable Disney trip ever!